Preventive Dental Care | Why Is It Important? Keeping your teeth as long as possible should be your goal. And that means keeping your teeth healthy throughout your lifetime. That is why preventive dental care is so important. Your ability to eat and drink, and your beautiful smile are all affected by the health of your teeth. Poorly-maintained teeth or untreated dental problems can truly impact your overall health and self-image, and lead to pain, infection or tooth loss. You don’t have to lose teeth as you age. With proper preventive dental care your teeth should last you a lifetime. Having a baseline for your current dental health will enable your dentist to catch any changes early and provide treatment. This is especially important with gum disease, or gingivitis, which in its early stages may not have symptoms. Your dentist will also recommend fluoride treatments that can aid in remineralization of your teeth. If dental problems do occur, catching them early is the key to preserving your teeth and saving you money. Smaller dental repairs like fillings cost much less than more expensive crowns or dental implants, for example. And most routine dental exams are covered by dental insurance. Poor dental health, like gum disease has been shown to link to the more serious health conditions as heart disease, diabetes, stroke and pancreatic cancer. Pregnant women are also at risk for premature birth. During a dental checkup, your dentist will check your overall dental health and screen you for potential health risks of gum disease and oral cancer. Preventive dental care should begin as soon as your child’s first tooth appears and should continue throughout a lifetime. Untreated problems in childhood will only cause worse problems, and expensive repairs, in adulthood. • Brushing teeth twice a day with a soft toothbrush and a fluoride toothpaste approved by the American Dental Association (ADA). You should replace your toothbrush up to four times per year. Brushing your tongue will also help remove bacteria and freshen breath. • Flossing daily aids in removing food particles and plaque-causing bacteria from between teeth. • Rinsing with a fluoride mouth rinse. • Eating a balanced diet that limits sugar and carbohydrates, and boost intake of fresh fruits and vegetables. Take vitamins, and drink plenty of water. • Avoiding smoking and excessive alcohol consumption that can cause dry mouth, tooth discoloration and plaque buildup, and potentially lead to gum disease and oral cancer. • Monitoring your own oral health for signs of infection or pain. • Keeping your regular dental appointments. 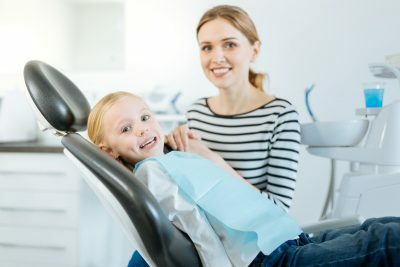 At Advanced Family Dentistry cares about the dental health of all our patients, young and old and everything in between. We encourage good dental habits, and educate patients in proper home dental care. As a full-service dental practice, we provide deep tooth cleaning, fluoride treatments, dental restorations, cosmetic dental care, and dental implants. And we are currently accepting new patients in the Northern Virginia area. Please contact our office today to set your next dental appointment.